It is official: We are finally “mobile-first.” At the conclusion of Q2, we reached the much-anticipated pivot point when all mobile traffic (direct and referred) caught up with desktop (see chart below). But while we waited, the mobile ecosystem and what we thought we knew about mobile has evolved. Is your media company prepared? Since January 2017, total traffic from desktop to news sites declined by 14%, while mobile traffic increased by 34%. One of the main drivers for this is the growth in referred traffic from pages using AMP. For news sites, mobile has finally met desktop. Mobile readers are now more likely to go direct to mobile apps and homepages by typing in the URL than they are to be referred to a site by Facebook. 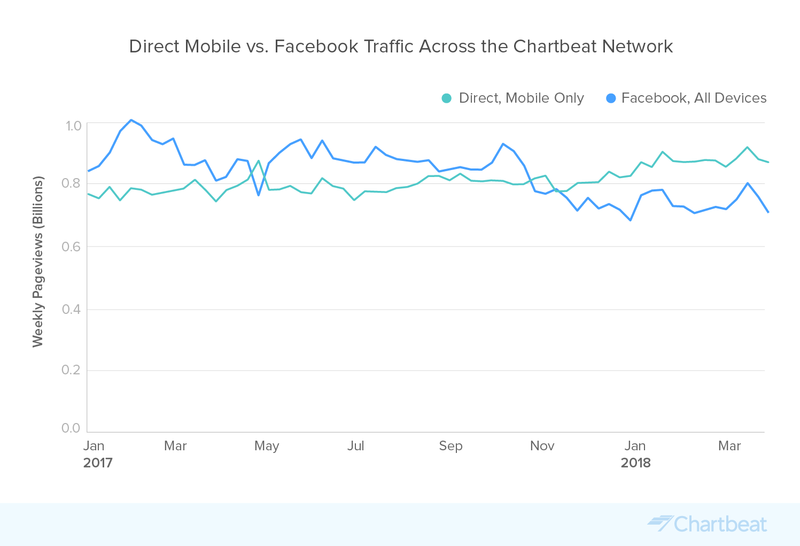 Recent data shows that direct mobile traffic surpassed all Facebook-referred traffic as of mid-October and is steadily climbing. Despite the recent News Feed changes in Facebook which have resulted in declining traffic to publishers (-15% since January 2017), readers still seek out news news, and they are doing so on mobile devices. 3. The browser: the next major traffic source? Are discovery tools in the browser the next main gateway to news? We’ve seen a rise of in-browser content recommendation modules, such as Google Chrome Suggestions. And, with a rise that started last year, traffic from Google Chrome Suggestions has grown 21x. Another is Pocket, which has an integration with Firefox and was acquired by its parent company Mozilla in February 2017. Pocket may be significantly smaller than Google Chrome Suggestions, but with a 297% increase in referral traffic since January 2017, it is worth watching. Google News is quickly trending up as a referrer source, particularly since May when Google announced an all new Google News app that replaced Google Play Newsstand as well as the old Google News & Weather apps. We will be watching this closely in the next few months, particularly as Google continues to execute the next steps in its mobile news strategy. 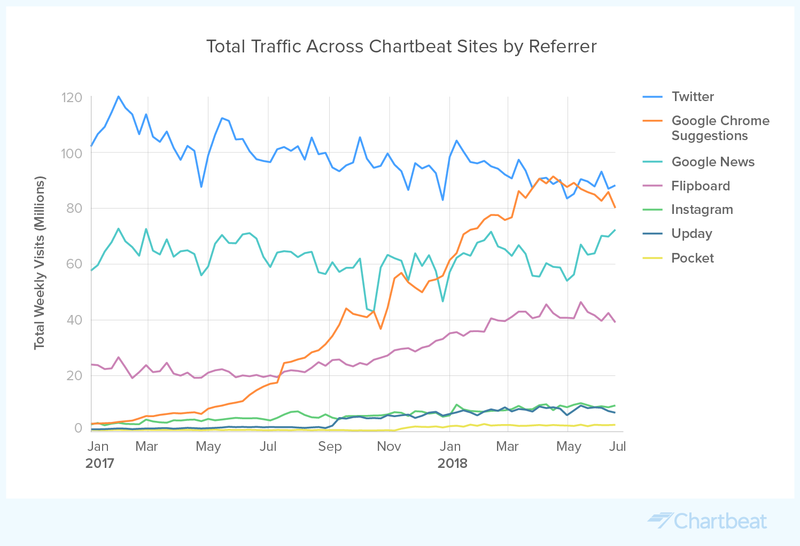 Flipboard has had a dramatic increase in the amount of referrer traffic it sends to publishers, and it is now a meaningful leading referrer, having doubled since June 2017. Instagram, which recently announced its billionth user, is commonly thought of as only a photo and video sharing app. However, we’re also seeing that it’s becoming a meaningful source of traffic for news sites; Instagram referrer traffic to publishers has grown 232% since January 2017. Even more surprising is Upday News for Samsung – a news app from Axel Springer that is featured on Samsung phones. Since January 2017, Upday saw a huge tick upwards of 763% growth in referrer traffic. Upday is one of the fastest growing sources of traffic for publishers in Europe. It is also now driving roughly the same level of traffic to publishers as Instagram. All of this indicates that the consumer demand for news via apps has strong momentum, and you should keep a close eye on the growing news app ecosystem as part of your content distribution strategy. You may think reader attention is more scattered on mobile than on desktop. However, our data shows otherwise, specifically with regard to mobile homepages. 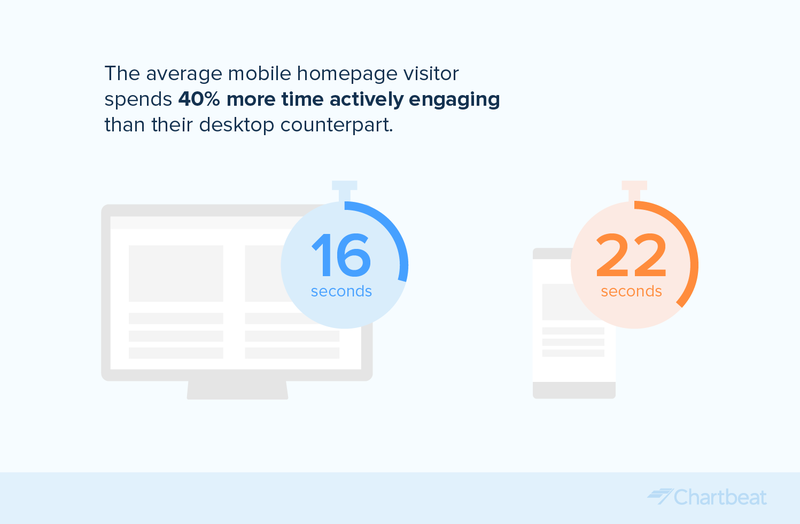 On mobile homepages, the average visitor spends 40% more time actively engaging than their desktop counterpart (22 engaged seconds on mobile vs.16 engaged seconds on desktop). While this comparison isn’t entirely apples-to-apples (you could imagine that a reader is more likely to idle in a more information-dense desktop experience), this is a notable reversal of the reading behavior we see on article pages, where desktop readers engage slightly more (38 engaged seconds vs. 34). Mobile readers are also 20% more likely to click-through to articles than those on desktop. Mobile homepage visitors click through to articles 68% of the time, compared to 57% on desktop. Whereas desktop homepage readers scroll more of the page, mobile readers are more engaged in reading articles by clicking from the mobile homepage into content. What does this mean in terms of how we value the mobile reader or monetize the mobile homepage? There is no doubt that the consumer, publisher, and device-maker shift to mobile is driving growth and evolution in how and where traffic flows around content. Consumers are increasingly seeking content directly on publishers’ mobile websites and apps. They are also using news aggregators, where we see a new class of secondary traffic referrers emerging. And with mobile homepage readers more engaged in content than we thought, now may be the time to rethink what we thought we knew about mobile.